I like my food, particularly meat. As much as I adore freshly grown vegetables and salad, I can’t do without meat. In the UK I can go to any supermarket or butchers shop and buy exactly the cut of meat I need for a particular recipe. Now here is the problem. When I buy meat in Latvia I have great difficulty in recognising which part of the animal the meat comes from. This is not unusual. I remember as an eleven year old going to buy meat with my dad in a market in Rovinj, a beautiful coastal town in the old Republic of Yugoslavia. We hadn’t a clue what we were looking at in front of us. Now it is nearly 40 years since I left catering college and the nearest thing I got to butchering anything was trimming a rack of lamb. Undeterred and armed with a saw from a local diy shop and my trusty set of Global knives I decided to try butchering a whole lamb. Thanks to Dzons Brauns at Jokas Wines I found a local farmer producing what I hope is organic Lamb. I had forgotten how small lamb is. It only weighed 22 kg. I persuaded Inta to let me have the dining table for the task, covered in a plastic sheet of course. Suitably armed with the tools of the trade and a diagram obtained from the internet, I set to and 3 hours later the freezer was full. All very uneventful really. I think I must be adapting to life in the Latvian countryside. However it has given me the confidence to try something bigger next time. 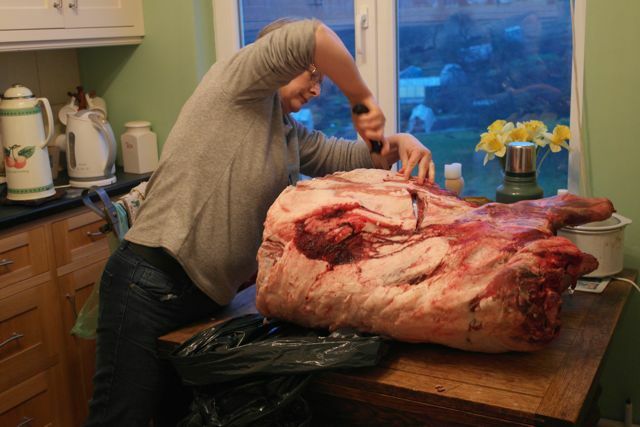 Not a beef cow, which could be as heavy as 500-600 kg but a pig. As a footnote we had some lamb chops last night and they were delicious. This entry was posted in Food, Latvia and tagged butchering lamb meat. Bookmark the permalink. I’ll get details to you. I was taken last time. So I just need to get address and tel no. Thanks so much. How far away from Sigulda are you? Just wondered if you wanted to meet up sometime over Christmas so VINETA and I can introduce ourselves. The only meat I eat is beef nowadays & in small quanities suitable for beef barley soup or Borscht so the cut is not important which is good because I get my red meat from Rigas market and it is simply displayed as a lump of protein. Absolutely nothing that could be identified as a Chuck, Short Loin, Round, Plate, Shank or Flank let alone Sirloin, Tenderloin, Top Sirloin or Bottom Sirloin. Never seen Brisket or ribs, just tongue and liver & bits-n-pieces. There’s always a guy flailing away on something propped up on a wooden chopping block with a huge chopper but I would hardly call that operation a butcher, so, no attempt at conversation is called for. I don’t eat lamb or pork but your solution is the obvious one. Have a good look at what you are cutting up is the only way to know for sure what you have on your plate. Got lots of apple trees. No pigs yet. How long did it take you to do? How heavy was it? I think I need a bigger saw and chopper!!!! To buy some lamb, You can contact Mikaitas, they are near Limbaži, in Kaijciems. They mostly breed sheep, but meat is sometimes available, so just contact Aija via e-mail. They have biological farm and what I find very interesting, they use herding dogs!